HF32D (800MHz – 2.5 GHz) - Not Audible - Beginner or an Entry Level RF Analyzer. Rated as a Beginner or an Entry Level RF Analyzer. Wireless communication is a sophisticated and complex technology. The tools and know how required to reliably detect and assess its effects must be its technological equal if not its better. The HF32D raises the bar for what we think of as 'entry level'. During the manufacturing process strict calibration procedures are followed using only high end, calibrated measurement instruments. 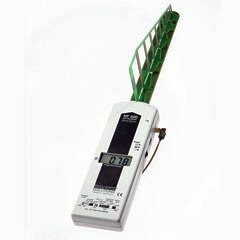 This guarantees that every HF32D meter made by Gigahertz has been individually calibrated to a traceable standard.